Have you heard about auto-renewals? Beginning Mon., Feb. 11, PPLD will save you the step of renewing your checkouts. 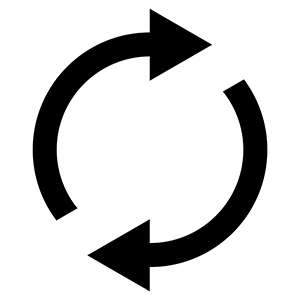 The day before items are due, the library’s system will automatically renew them if there are no holds and they haven’t already been renewed twice. Patrons will receive an email notice letting them know what, if anything, was renewed as well as the new due date. Fold any size piece of paper in half. Fold one side up to meet the first fold. Create a picture of an animal or person on the folded paper. Make sure to put the mouth of the creature at the fold. Then open up the picture and make your creature look scary! Fold it back up and show the folded picture your friends and family. Say, “Isn’t it cute?” Then open up your picture quickly for a fun joke. 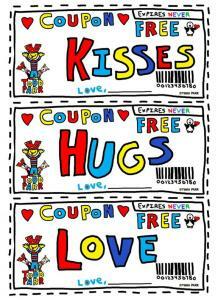 “Random Acts of Kindness” Month! 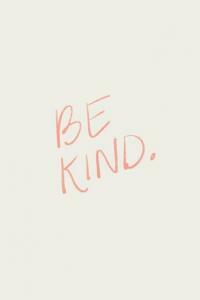 February is “Random Acts of Kindness” month. Click the link below to see great reading suggestions. Overdue books? Fear not. Pikes Peak Library District will no longer charge you for being a little bit late on your returns. The library will officially eliminate overdue fines Fri., Feb. 1, just in time for a county-wide celebration of Library Lover’s Month. Patrons will no longer be financially penalized for books that are late in returning to the library. Fines, Blevins says, are particularly prohibitive for the community’s most vulnerable families. Plus, overdue fines accounted for less than one percent of the library’s overall revenue in 2017. There will still be fees assessed for lost or damaged materials. Materials are considered lost if they are 21 days overdue. Additionally, Pikes Peak Library District will roll out automatic renewals later on in Library Lover’s Month. The day before books are due, the library’s system will automatically renew them up to two times, so long as no other patron placed a hold on the material. There are some exceptions to the materials that can be automatically renewed, like rapid reads, e-materials, and equipment checkouts. We want to celebrate your successes! Pikes Peak Library District is looking for stories about how our resources and staff have helped enrich minds, fuel learning and growth, spark imagination and ideas, build community and connections, and/or achieve goals. To tell your story, click here and take our short survey. Fill a variety of bowls or containers with water and freeze them at least overnight. Different sizes and depths are preferred. Remove the ice shapes from their containers and place them on the plastic tray or cookie sheet. Give your child a bowl of table salt – the cheaper the better. Have them sprinkle it on the top of their ice. They can also use a dropper to drop warm water on. Watch as ravines form down the side of the ice as the salt melts it! 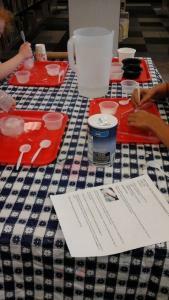 Squeeze a little bit of a food coloring onto the ice and watch what happens! The food coloring or liquid watercolors will highlight the ravines, crevasses, and tunnels that are forming. Discuss how salt melts the ice. Struggling with your laptop, tablet, or smartphone? 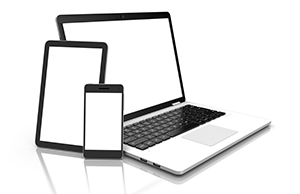 Bring your device and a staff member can assist you in troubleshooting the device on the second and fourth Tuesday of each month from 2:30 - 4 p.m. at Library 21c. 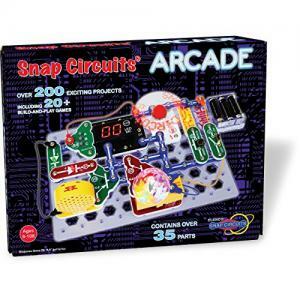 Create over 200 exciting circuits that support STEM curriculum with Snap Circuits Arcade! Snap together a disco ball, word fan, human alarm and more! For ages 8 and up. This kit is available at our Educational Resource Center. 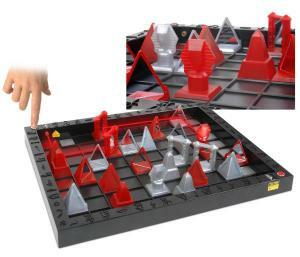 Play chess using lasers with the Laser Game, Khet! Strategically bounce the laser off of mirrors in order to “hit” your opponent’s pieces. For ages 9 and up. This game is available at our Educational Resource Center. For the 27th year in a row, Pikes Peak Library District is being recognized for excellent financial transparency. 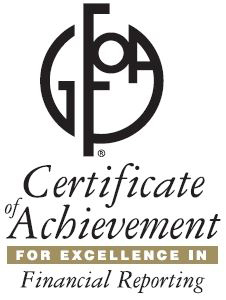 The Government Finance Officers Association awarded Pikes Peak Library District the Certificate of Achievement for Excellence in Financial Reporting this month, the association’s highest award. Each year, the association judges government organizations through an impartial panel. According to the association’s website, the program was designed to motivate government agencies to “go beyond the minimum requirements of generally accepted accounting principles,” with the goal of encouraging financial transparency by those agencies. Earning this award illustrates an organization’s commitment to good stewardship of public dollars. The president of the Pikes Peak Library District Board of Trustees attended her last board meeting after ten years of service to the library. Kathleen Owings will retire from the board as of Dec. 31, 2018. Owings first joined the board on Jan. 1, 2009, and was board president from 2012-2014 and in 2018. Her fellow board members, library employees, and library leaders alike reminisced fondly on Owings’ contributions to the Library District and the community during her final board meeting on Dec. 11, 2018. Owings is a Principal and Financial Advisor with Westbilt Financial Group. She is also a current and past member of several boards throughout the Pikes Peak Region, including the Children’s Literacy Center, Colorado Springs Chamber of Commerce, Colorado Springs Leadership Institute, and the local chapter of the West Point Alumni Association. The new president of the PPLD Board of Trustees, Wayne Vanderschuere, will take over the role on Jan. 1, 2019. Terms on the board are five years, and board leadership changes annually. Hot Cocoa Mix Makes a Great Gift! Pour 1 Tablespoon of M&M’s and 1 Tablespoon of mini chocolate chips into the jar. Put your peppermint candies and ¼ cup of marshmallows into a bag, and carefully squish into the jar. Use twine to attach a gift tag. Your mix is ready for gift giving! Note: If you don’t mind a little mix on your marshmallows and candies, you can leave the bag out. For an added look, you can paint your caps. Just make sure they dry before you try to seal the jar up! Learn basic line dance steps with Patti. Each week we will review steps taught in previous classes in addition to learning new steps. Where: Library 21c, 1175 Chapel Hills Dr.
PPLD Maker in Residence for January/February 2019, Linda Riley learned to knit when she was a young girl, taught by her granny when growing up the Chicago suburbs. 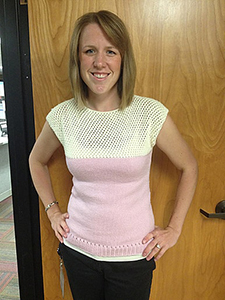 She continually grew her skills and eventually began creating her own unique patterns. Her original designs have been published in both print and online outlets. Her project portfolio ranges from simple items such as hats and scarfs all the way to full size afghans and cable knit sweaters. Mittens are her favorite item to knit! 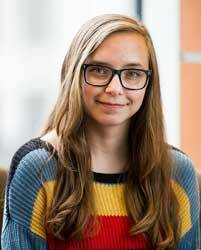 Alyssa Rail is one of two Pikes Peak Library District interns through the Inclusive Internship Initiative, a program run by the Public Library Association (PLA) whose goal it is to introduce high school juniors and seniors of diverse backgrounds to librarianship. This year, the internships were funded by donations to the Pikes Peak Library District Foundations. For Alyssa, this was an opportunity to spend more time in one of her favorite places and have an impact on her community. “I love how the library has always been a second home to me. It's welcoming and even if you're just picking up a hold and leaving, you still can enjoy your time there. I love that I could stay for hours and always find something to do. 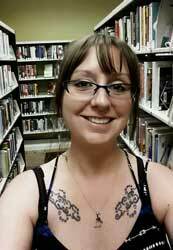 During her internship, Alyssa discovered just how important libraries are to everyone. How can you impact the lives of people like Alyssa? Give: Make a donation! Big or small - every contribution helps our community. 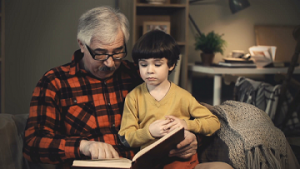 Share: Share your library experiences with friends and family. Post your story on Facebook, tweet on Twitter, send an email, or share the link above any way you like! Participate: You can be a part of Pikes Peak Library District and our community by participating in library programs and events! Ana Bojorquez was beginning to think she would never earn a high school diploma, no matter what she did. She bought preparation books, enrolled in classes and more, but nothing panned out. But then Bojorquez noticed an advertisement for a free program through Pikes Peak Library District that helps participants earn accredited high school diplomas online. Bojorquez was brought to the United States from El Salvador as a very small child, and adopted. Her adoptive mother, for reasons unknown, changed Bojorquez’s age on a lot of her documents and in the school system. 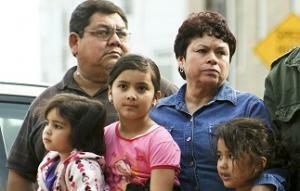 “They weren’t a very good family, so I ended up back in the foster system,” Bojorquez said. After being placed in foster care and re-enrolled into the school system, the school district made a startling discovery. The district took her out of high school, even though she begged to stay. 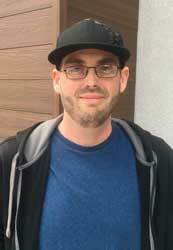 Bojorquez was enrolled in a GED class at a community college instead. At the same time, her social workers knew that her eighteenth birthday was approaching; Bojorquez would no longer be eligible for support from the foster care system and needed a job to survive. After experiencing success as a realtor’s assistant, the thought of a high school diploma faded from her mind until she met her future husband who was determined to support her in achieving her dreams. He finally convinced her to focus on studying full-time for a diploma. The couple relocated from California to Colorado Springs in search of work, had children, and once again her hopes for a diploma were dashed. That’s when she saw the advertisement on PPLD’s website for Career Online High School. For Bojorquez, who does custodial work for her church and volunteers at the school her two boys attend, an online program without a huge financial burden was an enticing option. She applied in March of 2017 and received her scholarship soon after. She then began to work tirelessly toward the goal she had for more than a decade. Less than two years later, Bojorquez celebrated a huge educational milestone. 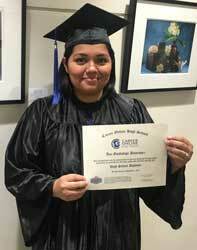 She completed the Career Online High School program and was the proud recipient of an accredited high school diploma at a graduation celebrated on Oct. 10 at East Library in Colorado Springs. How can you impact the lives of people like Ana? Give: Make a donation! Big or small - every contribution helps our community. Make your gift today. Share: Share your library experiences with friends and family. Post your story on Facebook, tweet on Twitter, send an email, or share the links above any way you like! Andi Sperry has been a Cheyenne Mountain Library patron for so long that it has become one of her favorite places to spend time with her husband. In her own words, Sperry tells us the library’s impact on her life. 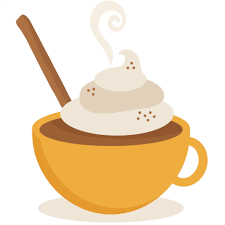 “I participated in the 2018 Winter Adult Reading Program because I love reading and enjoyed the incentives; chocolate, popcorn, and a beautiful coffee mug commemorating the event. My husband and I have also taken several classes for card making, guitar lessons, pasta making, herb and succulent gardening. We enjoy doing these programs because it’s fun to spend quality time together while creating something beautiful! Sperry hopes to have the same impact on others that the library has had on her. She truly believes that libraries are what help communities grow. How can you impact the lives of people like Andi and have a hand in the next generation of librarians? Give: Make a donation! Big or small - every contribution helps our community. There are various ways you can make your gift. Donate Now – click here to make your contribution today! #GivingTuesday – schedule your gift for November 27, #GivingTuesday, click on the link and hit save to put it on your calendar. Colorado Gives Day – Click on the link to schedule your gift for Colorado Gives Day, Tuesday, December 4. Beau Buren, a Career Online High School graduate hopes his new diploma will help him excel at a higher level in his career. Buren, a Colorado Springs native, finished the program in less than eight months. He set aside time after almost every full day of work and completed nearly six hours of coursework per day on the weekends. Buren has his sights set on college now that he has received his diploma. Buren is hoping to bask in the glow of his achievement until the end of the year, then reassess his goals and consider going back to school for a business management degree. How can you impact the lives of people like Beau? Laurie Frydendall and her family have turned trips to the library into a tradition. 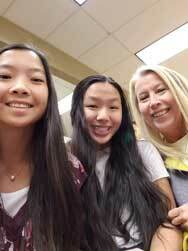 Her daughters have grown up at the library and are learning the many ways that libraries can help you in life. It’s not just with her family that the library makes a difference for Laurie, it’s in her job as well. The opportunities Laurie has found at the library have inspired her to see the library as more than just a place for books. How can you impact the lives of people like Laurie? 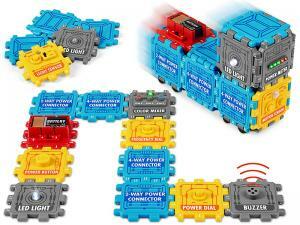 Experiment with light, sound, motion, and more using our Power Tiles Circuit Kit! Interchangeable circuit tiles snap together in every direction for endless exploration. Design your own circuit or create a night-light, a beeping alarm, and more! This kit is available at our Educational Resource Center. For ages 6 and up. 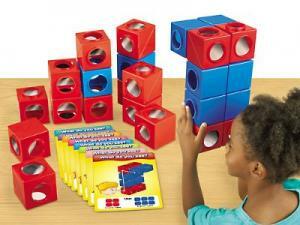 Create countless mirror mazes with our new set of Mirror Discovery Cubes! Great for the scientific exploration of reflections and angles for kids ages 3 and up. This set is available at our Educational Resource Center. Download the new PPLD app!